Fort Plain was when I first discovered the joy of sleeping on deck, and I continued my sleeping habits in Ilion. The plus side of staying on deck is that it is actually cool enough to sleep in a sleeping bag, while the downside comes in the form of mosquitoes and trains. In the end, I got used to watching the dome of light appear across the canal from Ilion Marina and RV Park in the night just before the train lights blinked by between the trees, and then the roar of it going on after the light had vanished into the trees again. Weather and mosquitoes were a lot tougher to get used to. 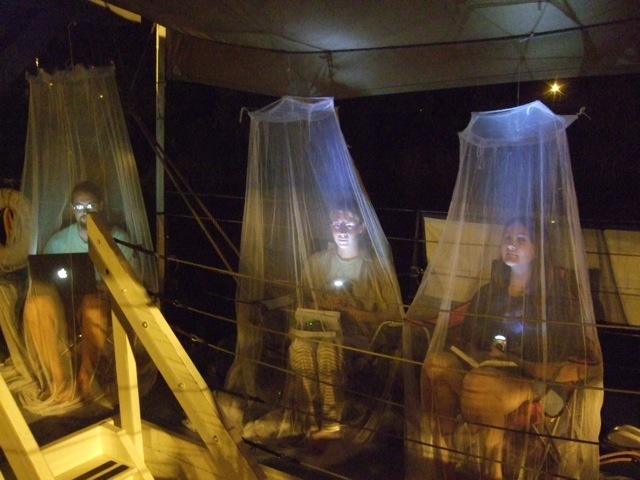 The attempt to get mosquito-less wireless access led to some rather interesting photos. In the morning, as I was taking advantage of the laundry service offered by the marina, I looked out and saw that our run of great weather had seemingly come to a very wet end – it was pouring! Thankfully it cleared up for our public hours, but at about 1 in the morning, it began to rain again, necessitating a rather quick move to the hold to stay dry. Thankfully the weather cleared off, and I’ve got high hopes for being back on deck tonight! Blake is a conservation lab intern at LCMM. She will be a senior at Bard College this fall, where she is studying Colonial American history.